that took some problem solving to work around an 8" x 8" pine post. 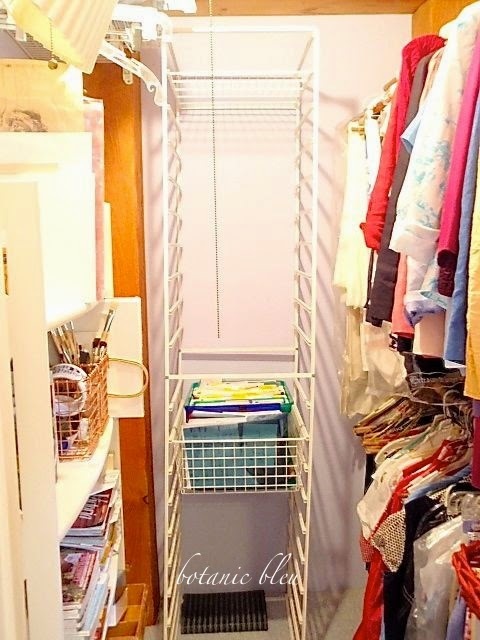 With a little planning and organization, an existing closet now works better. 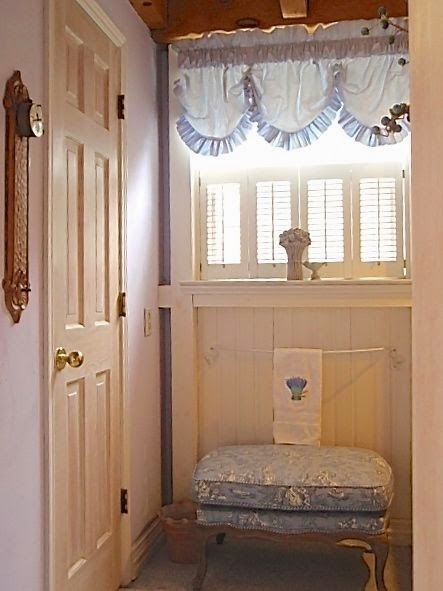 The little closet is behind the door on the left. 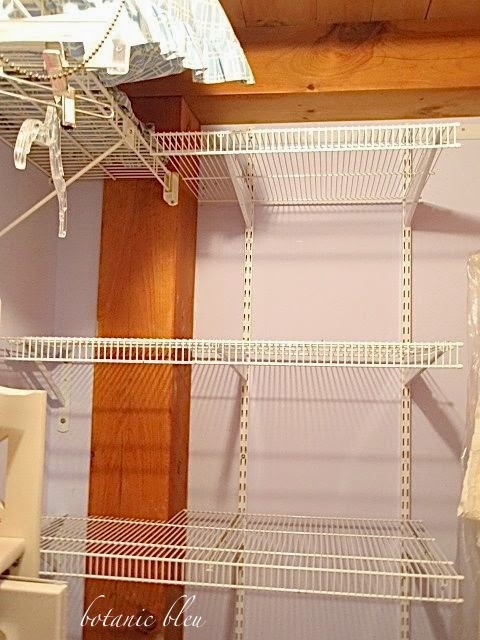 a new space for L I N E N S.
to create a better, bigger set of usable wire shelves in the closet. 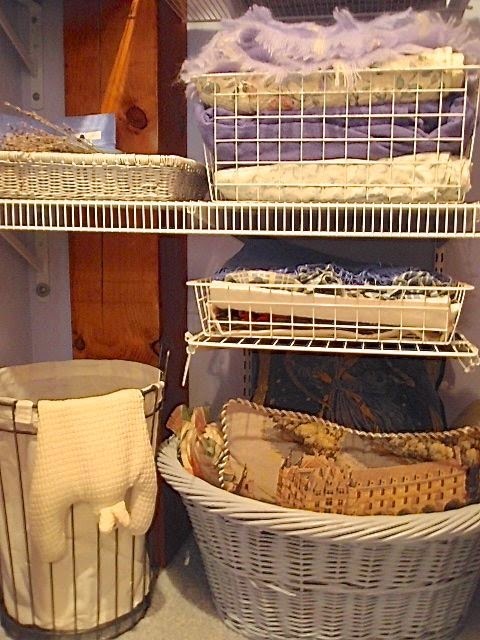 My closet had a tower of wire baskets that no longer functioned as needed. and had to be replaced with 20" deep x 36" wide wire shelves. 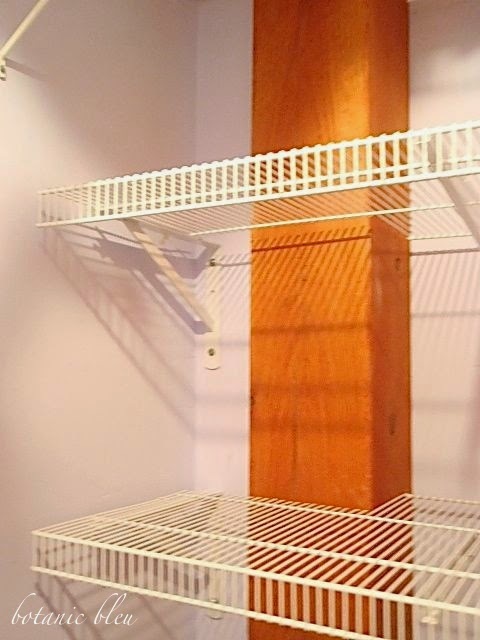 The new shelf system has four shelves hanging from two vertical supports. 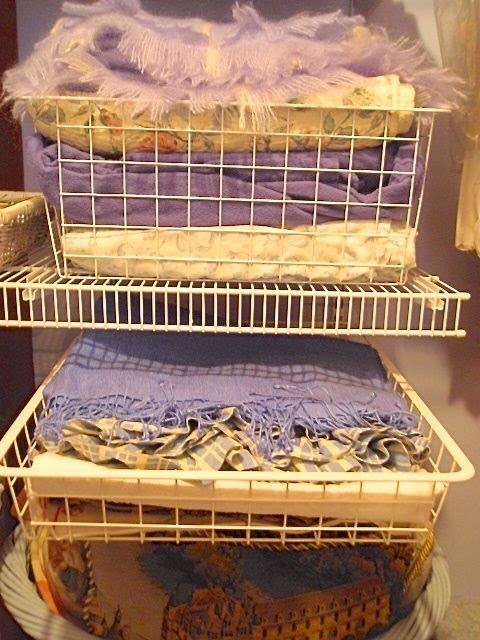 the old tower of wire baskets. Here is the old tower for wire baskets. At first glance, it may appear there was more space in the old tower. The key, however, is USABLE space. 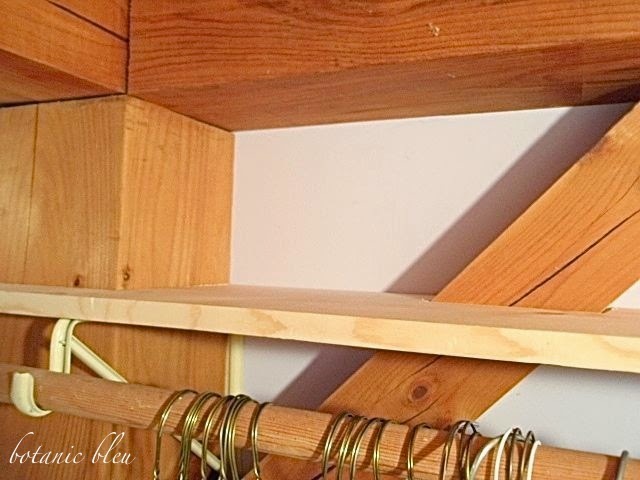 There is minimal obstruction to the shelf space by the support brackets. In the old tower system, the shelf widths were only about 18", confined by vertical supports on either side. The new shelves are 36" wide with almost all of the space unobstructed by supports. The new top shelf adjoins the existing old narrow wire shelf making the top shelf 36" wide also. The new shelf system allows unobstructed use of the floor space under the shelves; whereas, the old wire tower cut up the floor space into two small sections on either side of the tower. Do you see how the new design worked around the 8" x 8" pine post in the corner? The new shelving system came from Lowe's. 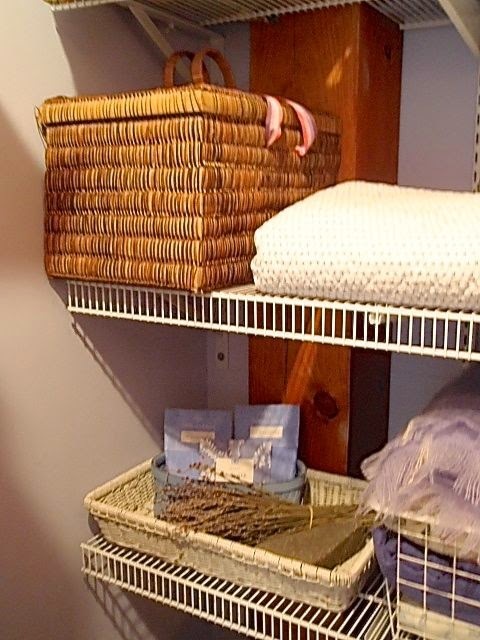 The 20" deep wire shelves come in 4' and 12' lengths. Somedays it is just your lucky day. to cut the 12' shelf into four 3' shelves for me. than cutting off one foot from 4' long shelves. at home to fit around the post. shelf's length was custom cut to fit against the wall. the use of three vertical hanging supports mounted to the wall. and one brace support next to the wall. little space was lost to the brace. we used cable ties to tie the two parts together. above the existing clothes rod on the right side of the closet. the structural corner brace of the house's post and beam structure. Not visible are the slanted cuts in the pine shelf that made a good fit. Ready to see what is on the new shelves? empty pillow covers to change out how throw pillows look. supported by the old wire shelf and the new shelf. 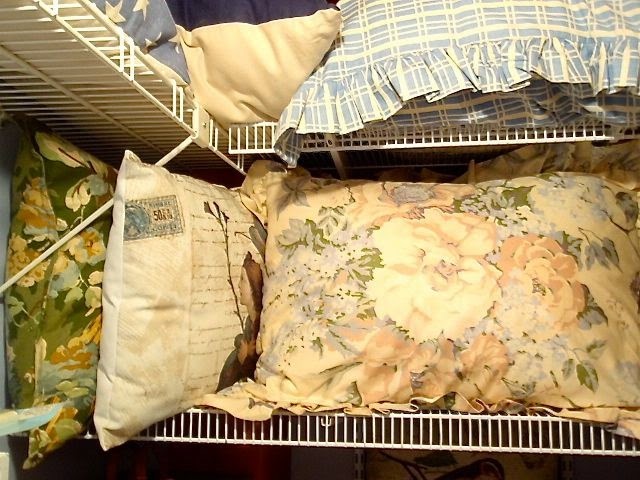 The new shelves easily hold three bed size pillows. Behind the yellow floral pillow are two more bed pillows. The two decorative throw pillows fit perfectly in the space in front of the pine post. The pine post and new braces along the wall are easy to see in this photo. Wire baskets from the old wire tower system work in the new system. The small shelf at the bottom is one of the old useless shelves. See the new vertical support brackets peeking out along the back wall? the old shelf to the new braces. Still need to snip off the end of the cable ties. beneath the four new fixed shelves. Woven baskets easily fit in front of the pine post. and has room for more things I want to hide. to keep the closet fresh smelling. a tapestry bought in France of the Chenonceau Chateau. 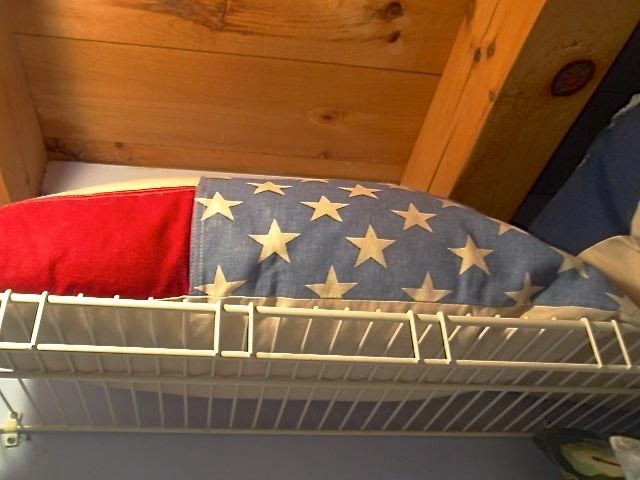 A long rectangular patriotic pillow fits easily on the narrow wire shelf. 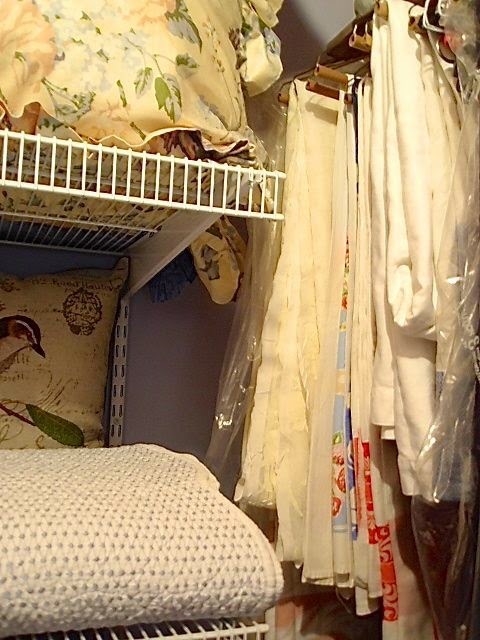 Along the back right side of the closet hangs most of my tablecloths. I think my mother will like the new shelves as much as I do. The new shelf system is made by Rubbermaid found at Lowe's. know where to find similar products. Always such a good feeling to get everything in it's place! Yay! You rocked the closet!!! Do you want to come do mine? I'm still stuck in the kitchen with cleaning out every drawer and cabinet! It looks great, Judith! You will enjoy the organization and new space! Part of my task this afternoon is to do some tidying of the studio -- it's been far too long since that was done! 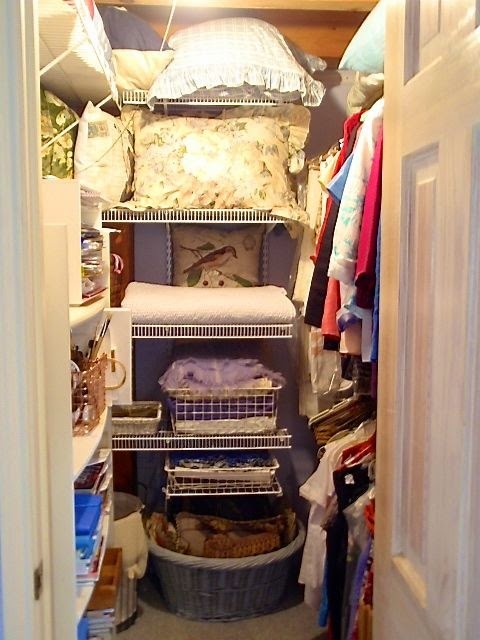 You know how to maximize a small space! 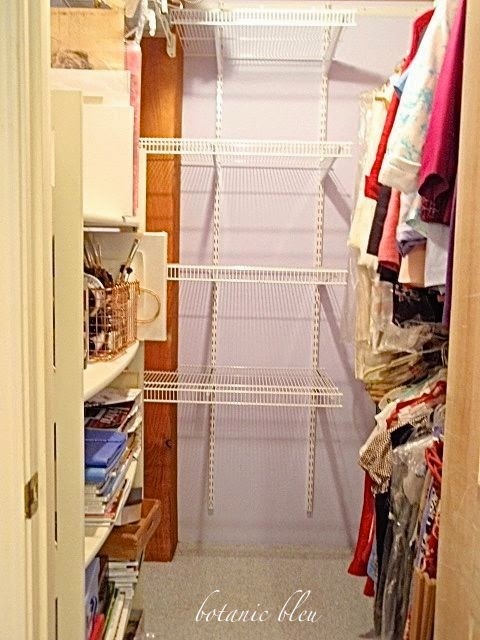 I so needed this closet inspiration, as I have three to tackle shortly. Your house is beautiful!. Perfectly crafted and dressed . . . even the undergarments! Judith, kudos to you for getting this so organized. I need to bring you to Austin to get my closets organized. '-) You packed a lot into this small closet. Great job! Wonderful job Judith! The changes you made transformed the space and gave you so much more room, love it! 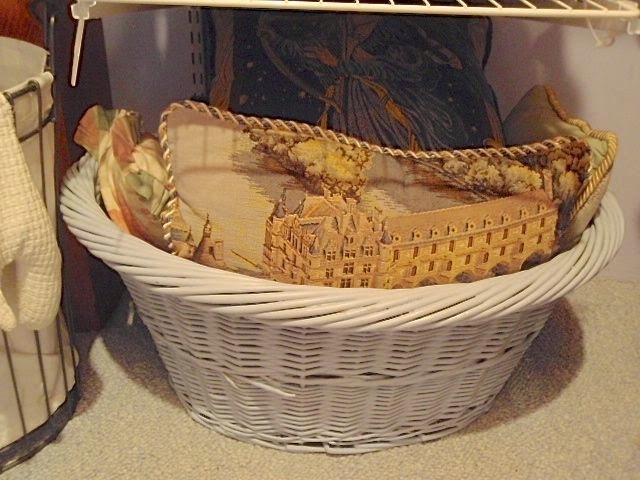 Love the use of baskets!!! It;s always great to find extra storage...great job here. Ok, I want a closet like this. Fabulous. Thanks tons for linking to Inspire Me. That looks great Judith! Thanks for joining HSH!